90% Dimethylsulfoxide. An industrial solvent well known and well used in veterinary circles. It is much appreciated for its superior ability to calm swellings, relieve inflammation, and even help when spinal and head trauma are involved, simply because DMSO penetrates the animal’s skin quickly and in sufficient amounts to assist in the healing. It is also used to carry and deliver other medications to injured or diseased sites. Since 1970 this substance has been approved for use in animals. However, this is a substance that easily penetrates the skin, there are some warnings and dangers to consider. 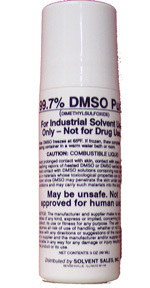 DMSO itself is non-toxic but may become dangerous when it is mixed with other substances, because of the skin penetrating properties this drug has. Competition regulations often ban the use of DMSO because it's use with anti-inflammatories is considered performance enhancing. Be sure to always wear thick rubber gloves when using DMSO on your horses. Be sure you are skilled enough to use it appropriately and safely. Oh...here is another interesting fact about DMSO...it freezes at 65 degrees Farenheit. DMSO Roll On: 3 oz.